No matter what time of year, this area is full of water and fresh green plants! Vultures are very fond of the Kourtaliotiko gorge and we regularly spot them while descending and climbing the steps. This trip is perfect to have a group activity for all ages and varying abilities. Apart from enjoying the beautiful nature, this trip ensures a fun day for all that join! Active day of fun... together! Maybe some pottery to end the day? 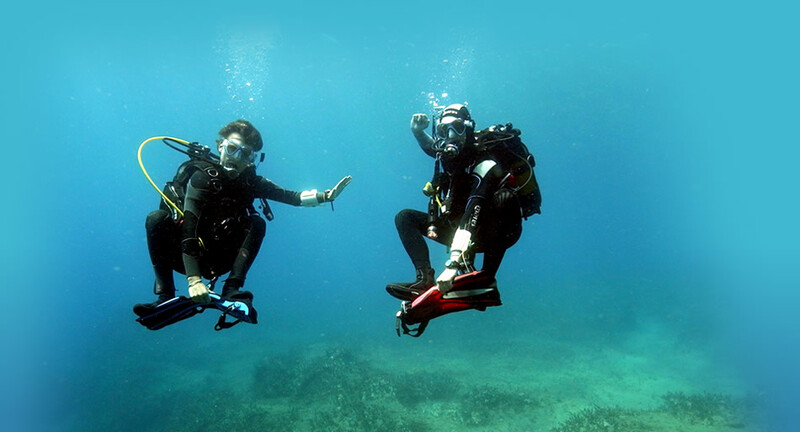 It is the perfect activity to give divers and non-divers a wonderful day together – share the joy! Once we arrive at the gorge, we start by walking down steps to get to the river. We will point out local herbs and hopefully spot some vultures circling above us! When we arrive at the river it is time to get wet! We walk upstream through the river until we arrive at a beautiful pool of crystal clear water, with a small beach at the side. Here we give a presentation on how to use a mask, snorkel and wetsuit to those who never snorkelled before. Then we put on our wetsuits, masks and snorkels so we can swim and walk through the gorge to get to the impressive waterfalls – keep your eyes open for shimmering eels! When you want to get back just let the water take you back to the small beach to rest and enjoy the sun! Watch the expert at work and maybe you will get a chance to try using his wheel too! We will end the day back at the diving school at about 15:00 to look back at the day together with the photos we took! * Swimming shoes, diving boots or teva sandals are all appropriate – but no flip flops! If you do not have any with you, do not worry – there are plenty of shops in Plakias where you can find swimming shoes! The minimum age to join us on this trip is 6 years old. However, if your child is younger and you would like to join, then contact us.